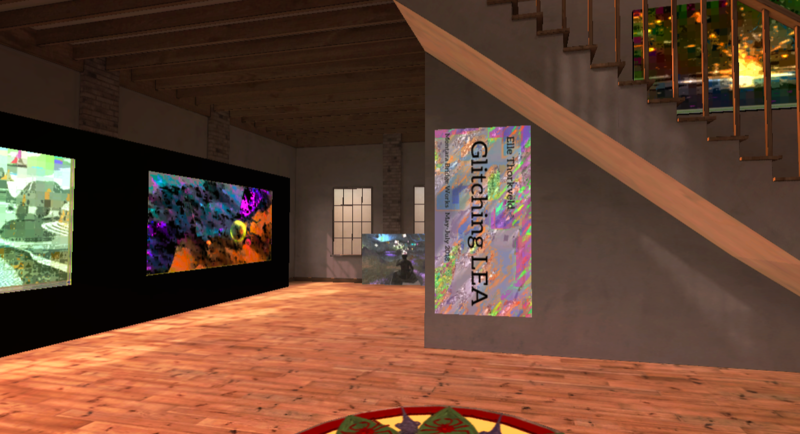 Glitching LEA is an exhibit of glitches of SL photographs taken at various LEA sims. Glitches were done in a variety of styles. All photographs were taken by Elle on her travels. 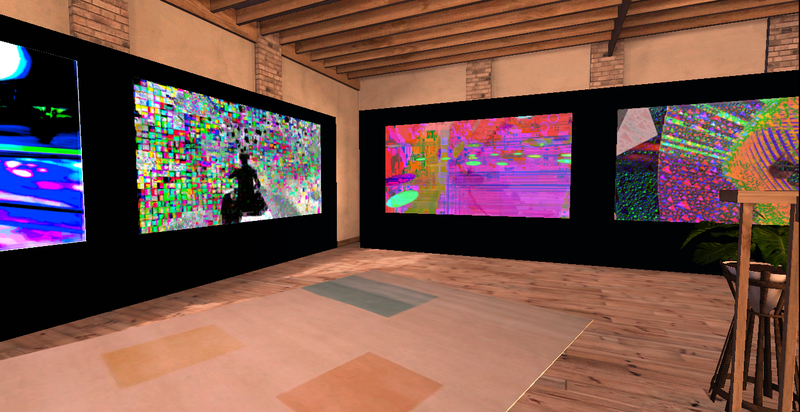 “Artist focusing on generative and glitch digital art and music. 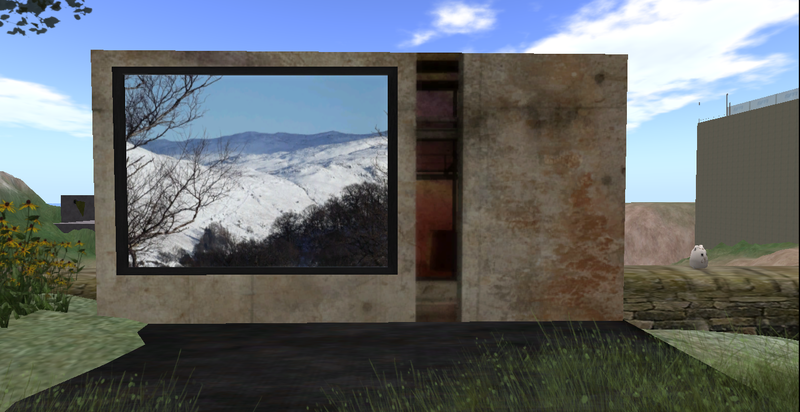 Enjoys creating SL sculpture, installations and experimental machinima. SL and RL photographer. RL mixed media artist. There’s a couple of weeks left to see the current exhibit at the art park and cafe in Quentin. 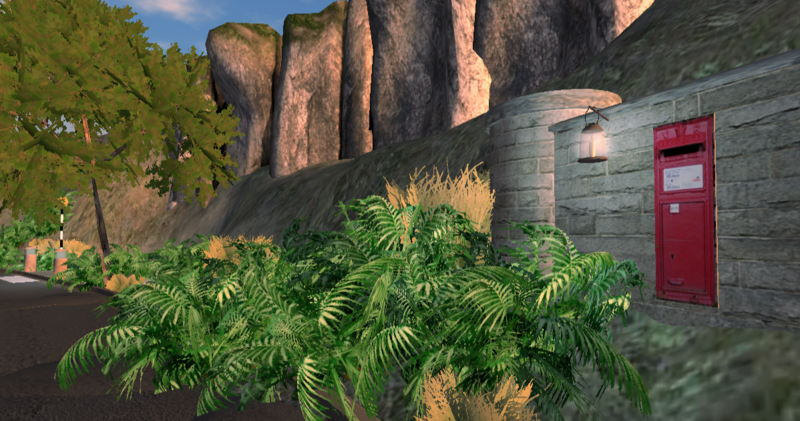 The installation in Quinn’s birdhouse gallery is called Heavenly Beachside by serra Qendra. 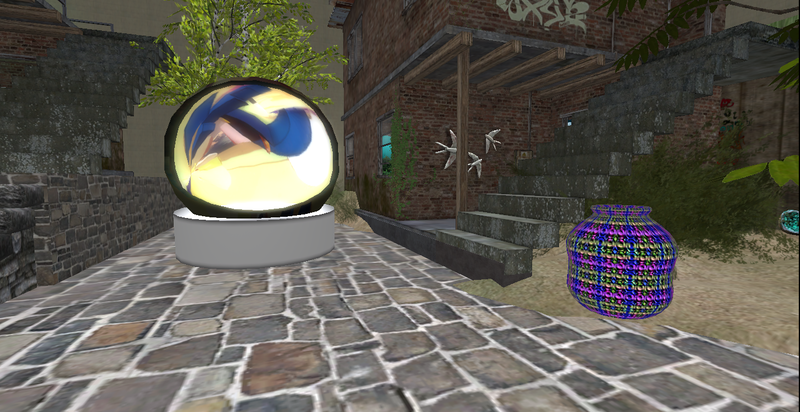 Virtual photography by Seraphim Placebo graces the fence on the Cafe side of Wanderlust. 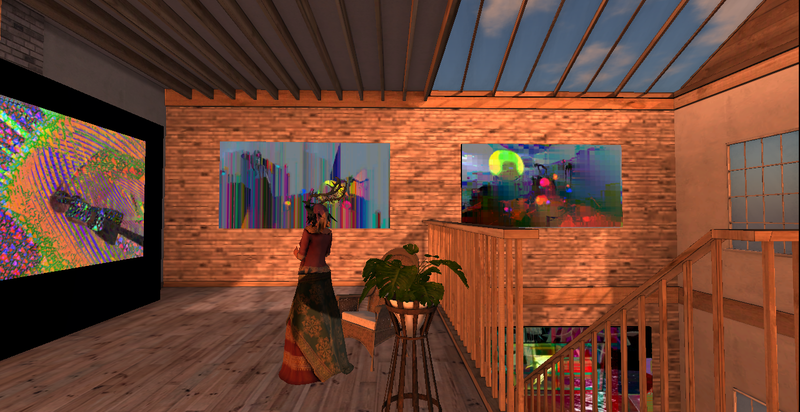 The story behind the art can be found on her Kind-hearted Avatar blog. The Cafe and courtyard are open 24/7. 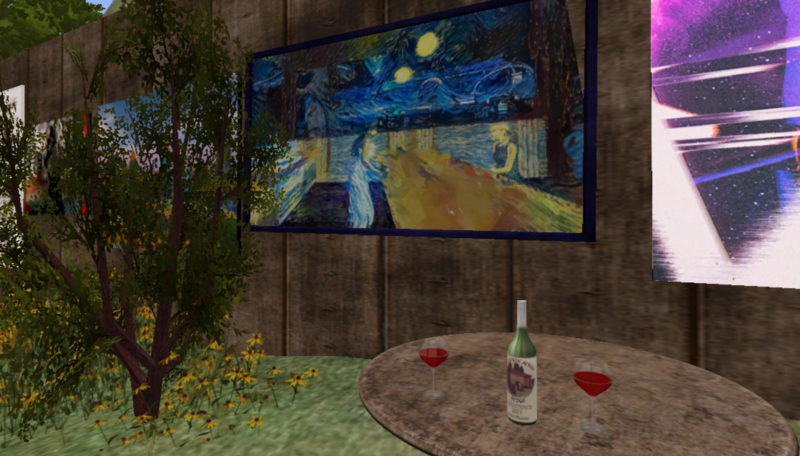 The Cafe rooftop displays an untitled diorama by yours truly. 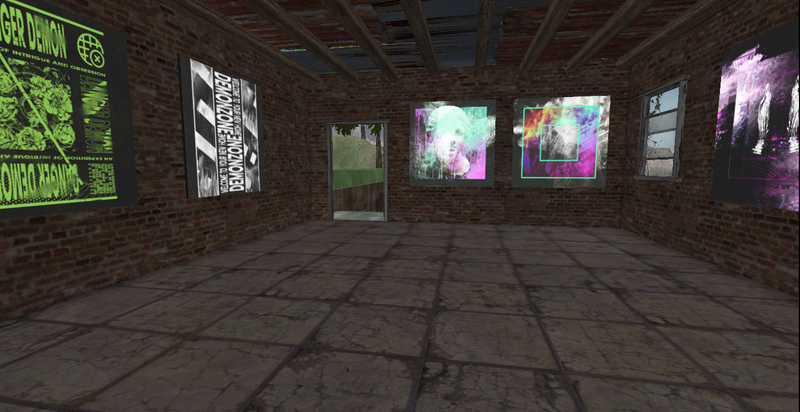 Upstairs in the gallery building is works by lil mint. On the ground floor, art by Giselle Seeker. 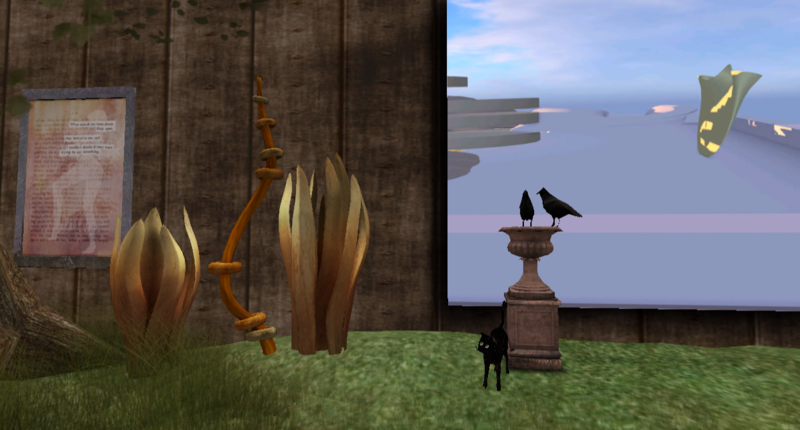 The 3D piece on the left is by serra Qendra; you can sit inside it. 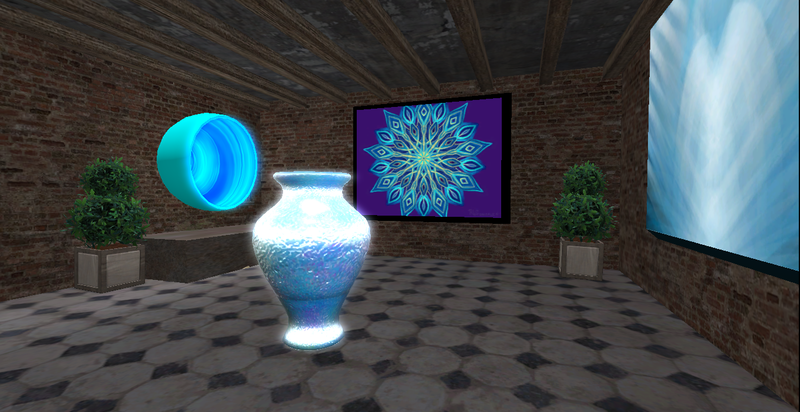 The decor piece on the right is by Lynette Trinity. On the park side, the goat that keeps the grass mowed looks like he’s been through a blueberry patch. 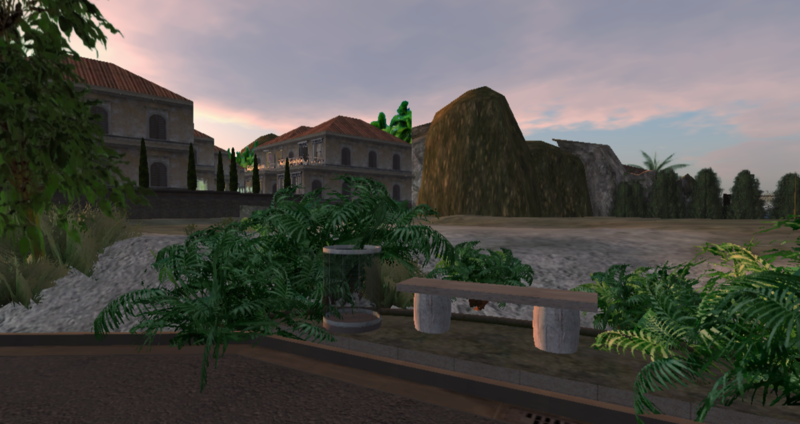 The piece propped up against the stone fence is by Klaus Bereznyak and contains a notecarded essay titled “Making Assumptions” written by him. The RL photograph is by Adrianna Biziou. Shown left to right, art by lil mint, Lynette Trinity, Elle Thorkveld and baker Bloch. A digital rendering I did of myself and Alice Lancaster. On the left, a piece by Wheedle; he has been changing his work every month instead of every two. Next, colorful art by Klaus and by Veyot. On the left, a piece by Art Oluja. The 2D art on the right is by serra Qendra. 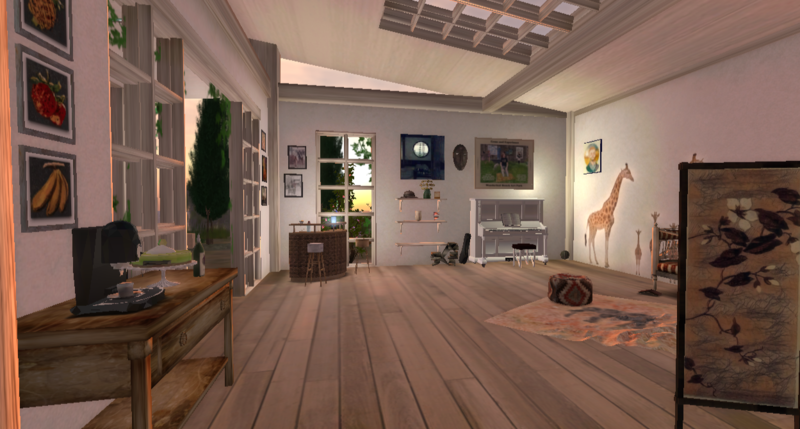 If you’d like to show some of your art in July and August, please contact Pearlgrey resident. Oh, the small pleasures in life. This is me, having just crossed the finish line in Kowloon’s Kart Ride. There were no other avatars in the immediate area and I drove really, really cautiously. 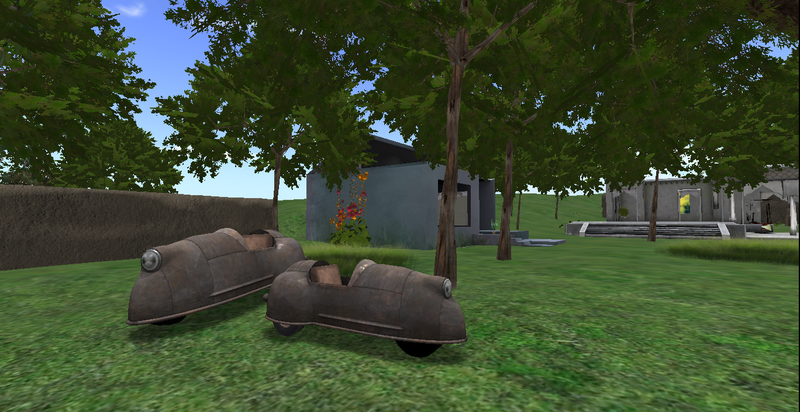 The vehicle steering works very well; I received a kart to keep for having finished. There are some objects on the track. Some appear to be for decor or interest; others seem to affect the vehicle if touched. I am truly surprised that I was successful on the first attempt. While being intrepid, I usually don’t do well at this sort of thing, not caring to waste time and energy. The instructions are simple. Everything is straightforward, except for the track which isn’t overly lengthy. 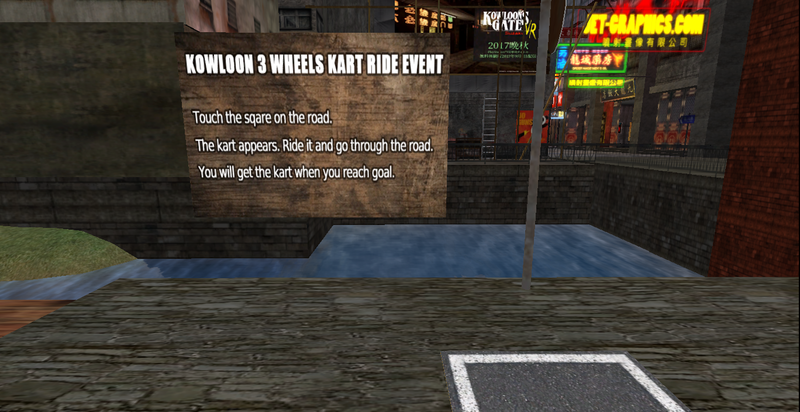 Afterwards, I test drove my kart through Applewood on Route 10 and it does very well on mainland roads. The textures are beautiful and the kart has a satisfying sound. The smaller version is included in the photo above. If you’d like to participate, the starting line is near Kowloon Gate Reborn. When we left off looking at Route 2 infrastructure here, we were in Fillip. I didn’t seem to cover a lot of road on this trip but there was a lot to photograph. 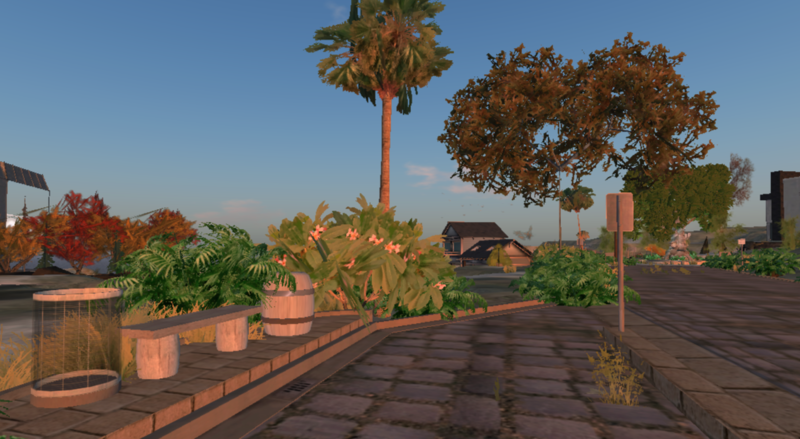 There are builds on both sides of almost the whole length of Route 2 that I traveled; where there is not, there are plenty of trees, bushes, flowers and road signs. After Fillip, there were one or two steps in Brindle and then I was in Ranunculus. I turned back to snap this photo of the median with alternating street lights by Alberto Linden and palm trees by Eric Linden. 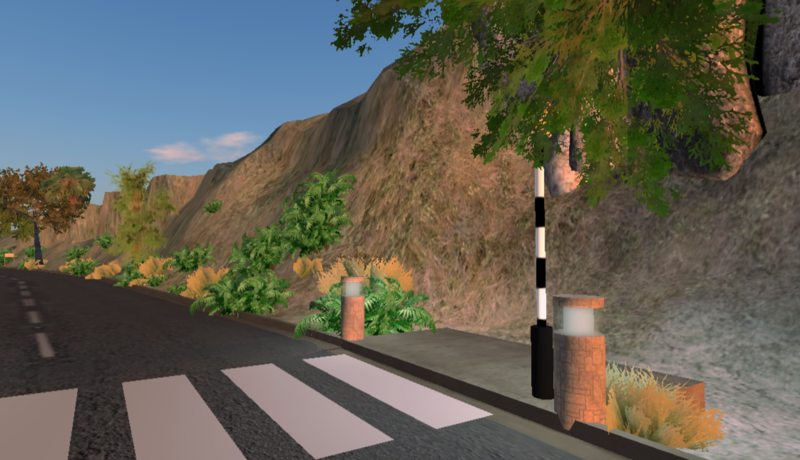 In Seraphim the paving changes and the median ends with a speed bump, foliage and lamps. In Ginsberg, there’s a Victorian Letter Box set into a retaining wall by Garden Mole. 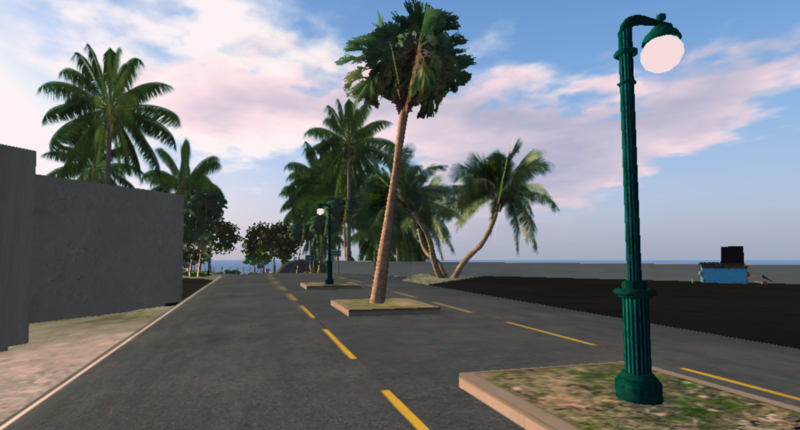 Right now there are numerous, some very large, parcels for sale on the mainland. Unlike in the fairly recent past, there are also many new builds; the roadside in this and other areas I’ve noticed recently are filling in. Pictured above is a crosswalk in Ginsberg. In previous posts in this series, I’ve focused on the infrastructure and avoided many of the current buildings in the background but it wasn’t really possible on this trip. Shown above is the Ginsberg Rez Zone. After a brief walk through Burnott, the paving changes again in Quaker. 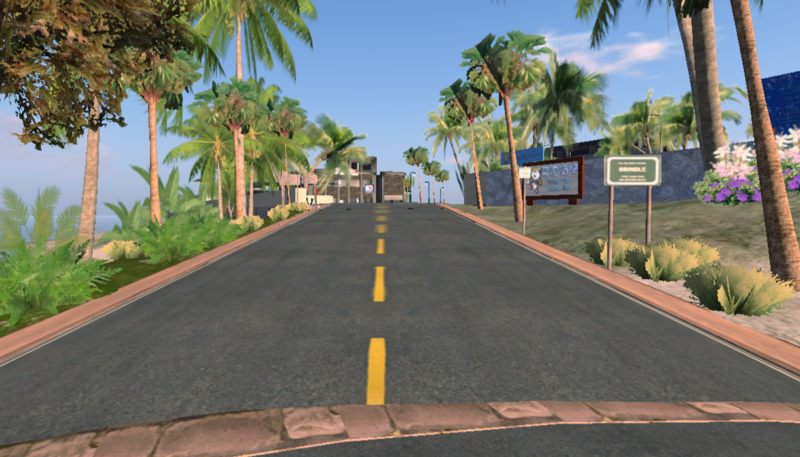 Just before the Valerian Rez Zone, there’s a guard rail on the left side of the road. 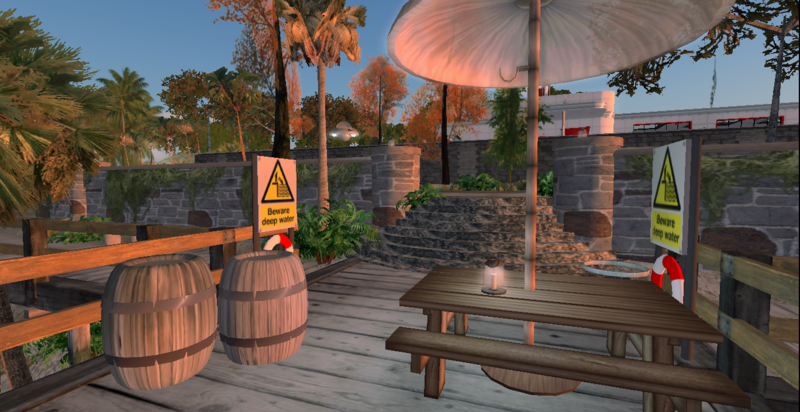 The Valerian Rez Zone has the usual bench, trash bin and in addition, a barrel. 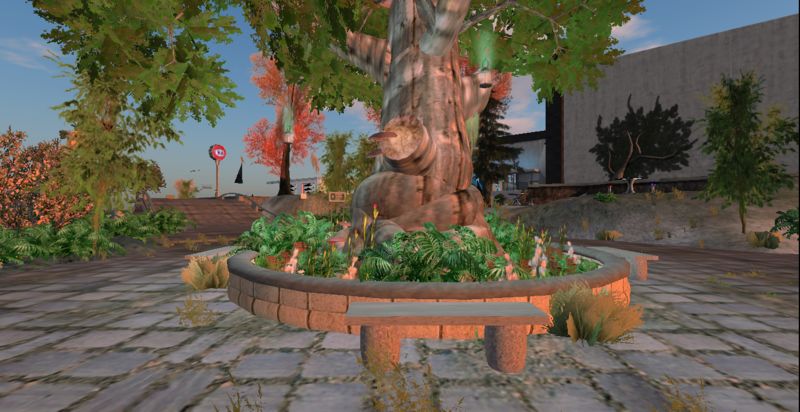 Soon I arrived at an intersection with benches and a tree in the middle. 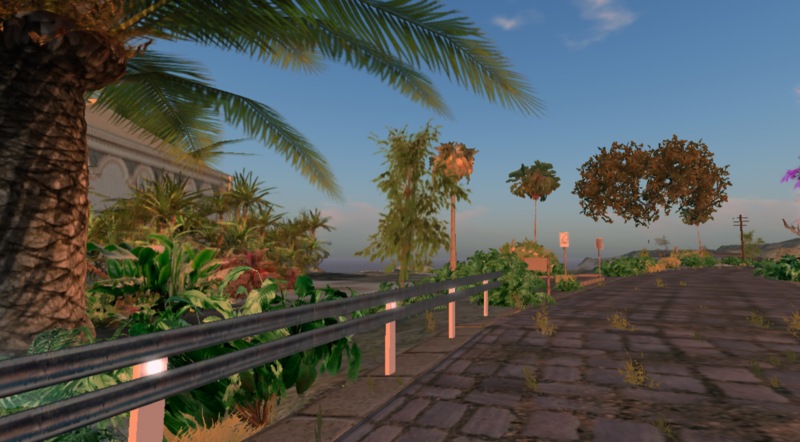 The road to the right soon becomes unpaved, leading through some rough terrain among random buildings. I kept going straight ahead on Route 2. This bridge is in Buff. 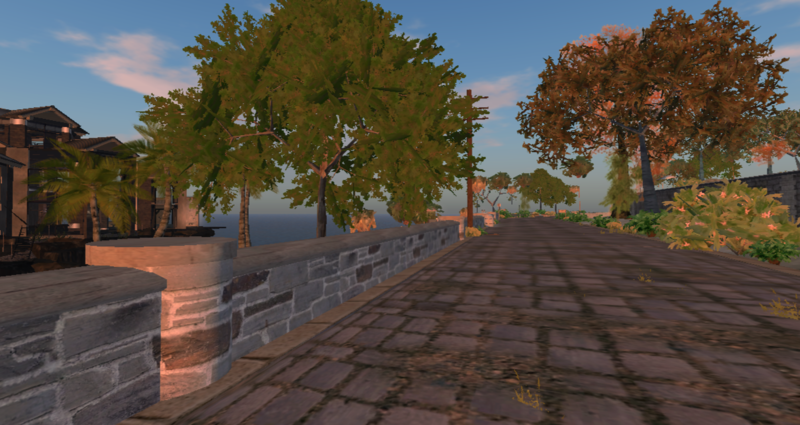 Right after the bridge, there’s a retaining wall on the left side of the road. 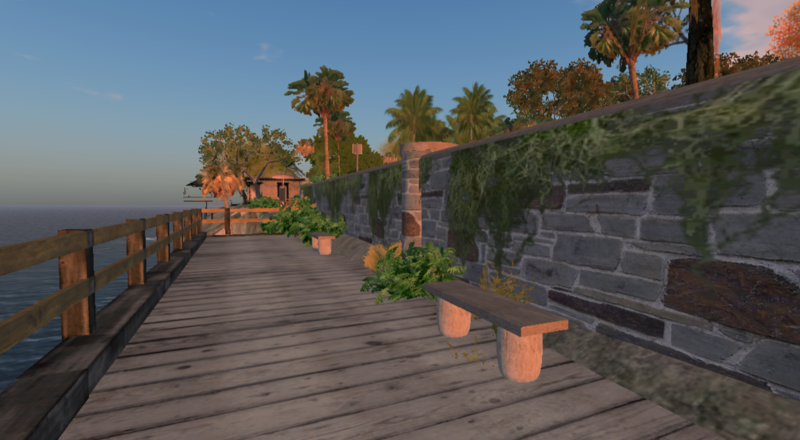 There is an opening in the retaining wall with steps leading down to Buff Pier. There are benches on the pier, which stretches out on both sides of the picnic area. These are plenty of photos so I will continue my travel another day. Just off Route 1 in Patagonia, Cafe Klaus has graced the area for over two years. It has been open 24/7 and has visitors every day. Lester, the cafe cat, is almost always around to greet visitors, if he’s in the mood. 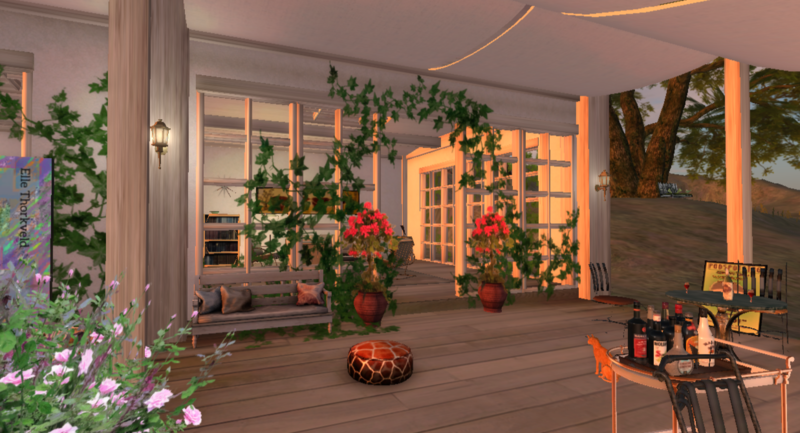 For over a year, Sundowners met regularly at 3:30 p.m. SLT. If you’d like to visit, you need to do so by about Monday 11th, in the evening SLT. Later in the week, you’re welcome to visit again and see what is new.